Allahabad High Court has recently examined the issue regarding the maintainability of writ of Habeas corpus when an order of competent court/magistrate court is in existence for giving the minor girl in the custody of father after she was recovered during the investigation upon an FIR lodged under Sections 363 and 366 IPC. The Delhi High Court asked the Central Government to reconsider its decision not to give Gallantry Award to a CRPF Jawan. The Court observed that a brave soldier needs to be recognized for his commitment to serve the nation with dignity and honour. The High Court on Monday ruled that transfer of intangible assets like intellectual property whose owners were not based in India could not be taxed in the country. The High Court of Gujarat on Monday awarded life imprisonment to seven persons accused of killing three members of Muslim community in Viramgam during the post-Godhra riots. Disposing of a Writ petition seeking Cow slaughter Ban across the Country, the High Court of Himachal Pradesh observed that it is open for the Union of India to enact law at the national level prohibiting slaughtering of cow/calf, import or export ofcow/calf, selling of beef or beef products under entry No. 17 of the Concurrent List. Setting aside a Family Court Judgment which had granted divorce to a Husband from his ‘Schizophrenic’ wife, the Karnataka High Court cautioned Family Courts to be more alive or alert to each case before them. The High Court of Kerala issued a press release stating that there is no ban imposed on the Journalists from attending court room proceedings. In the joint meeting chaired by Acting Chief Justice Thottathil B Radhakrishnan and Committee constituted to formulate a Code for Court reporting by the Press and electronic mediait was also decided to formulate a Code of Conduct which has to be mandatorily followed, in relation to reporting of Court Proceedings. It is also made it clear that the Individual Judges would be at liberty to decline access to any person to their chambers and offices of private secretaries and personal assistants, including personal assistants attending to the court work of that Judge from the Personal Assistants’ Pool. Taking Suo motu cognizance, a Division bench of the High Court directed the Police machinery and Government of the State to impose the restrictions in view of incidents happened in last few days between Media persons and Lawyers. The High Court of Madras recently dismissed an appeal filed by Chennai Metro Water Supply & Sewerage Board (CMWSSB), holding that illegitimate sons are eligible for government employment on compassionate grounds. Through an interim order, the First Bench of Madras High Court on Tuesday reiterated Judiciary’s stand that the new amended Advocates Rules have been kept in abeyance for all practical purposes. The High Court, pursuant to a Writ petition asked the state whether it could fund installation of CCTV cameras in all the District Courts of the State. Madurai Bench of the High Court held that the Government is empowered to attach properties involved in the commission of offences under the the Tamil Nadu Protection of Interest of Depositors (in Financial Establishment) Act, 1997. 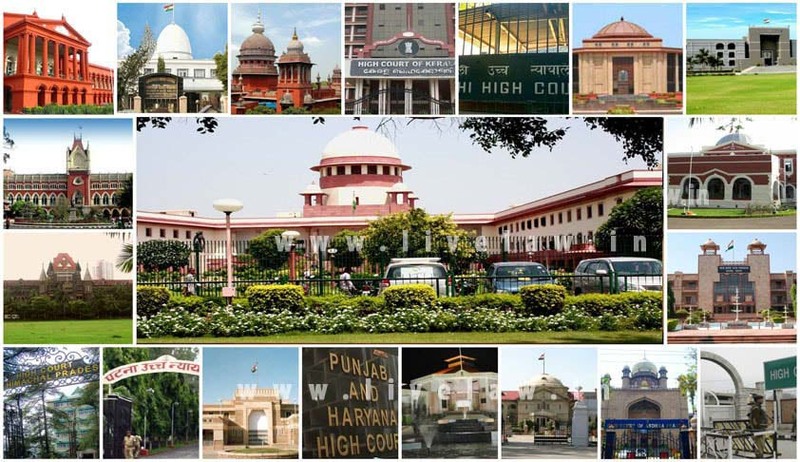 Punjab and Haryana High Court recently held that an adopted son is entitled to compassionate appointment though he was adopted after the death of the sole bread-winner of the family. The Court was considering a Writ Petition filed by the Widow of Gurcharan Singh, retired from BSF who along with his minor son were killed by the CRPF on account of their mistaken identity. Rajasthan High Court acquitted Salman in Chinkara poaching Case by allowing his Criminal Revision Petition filed against the Judgment of Sessions Court which affirmed the order of Conviction and sentence passed by Chief Judicial Magistrate, Jodhpur. The CJM had convicted him under S.51 of Wild Life Protection Act and sentenced to undergo 5 years’ simple imprisonment along with fine of Rs.25,000/- and in default of payment of fine to further undergo 3 months simple imprisonment. In the second case i.e. Criminal Case No.206/1999 which pertains to FIR No.163/1998, Salman Khan was convicted for five years for the alleged hunting on 28.09.1998. The appeal preferred against the said conviction, too, has been dismissed by the Sessions Court vide judgment dated 24.08.2007.